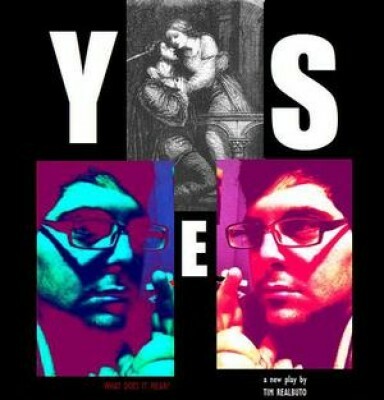 Tim Realbuto’s play “YES” though billed as one act with two scenes and an epilogue – it runs nearly 90 minutes – has the feel and heft of a full length play. I can’t image a second act. On the other hand, given the obvious genius if Realbuto – he wrote, directed, and acts to a fair thee well in this riveting play – I wouldn’t put it past him. More to the point, this alleged one act was so wonderfully executed, so beautifully realized, that I left the theater craving more Realbuto, as well as more from his equally brilliantly co-star Joe Blute. No doubt, YES which played to great acclaim at the Detroit Fringe Festival earlier this year – it also had a sold out run last year as part of NYC’s Emerging Artists Theatre series – will be seeing further life at other venues across the country. YES opens with the hefty Realbuto who plays Patrick Ness, a mid-thirties, down and out actor now reduced to giving private lessons in a liquor-strewn, messy, loft-like apartment is awakened by loud knocking on his door by Jeremiah Rosenhaft (Blute) a prospective acting student. From the moment the sloppily dressed Realbuto lumbers across the stage to open the door, shades of Orson Welles come to mind. Later on, as the play progresses and Realbuto’s acting becomes electrified, visions of the late Philip Seymour Hoffman begin to surface. As the play unfolds we learn that Patrick recently attended a high school production of Romeo and Juliet in which Jeremiah played Romeo. YES is something of a mystery – think Pirandello – as we are never quite sure what is real and what is not, what took place and what didn’t take place in the lives of each character, as the stories they are telling appear to be shaky. Are they telling the truth or are they acting for each other’s benefit? Even who initiated this meeting between Patrick and Jeremiah is questionable. Was this meeting solely Jeremiah’s high school acting teacher’s idea, was it Patrick’s who showed an interest in Jeremiah that brought the student to his door, or was it Jeremiah himself who claims to have had an epiphany after seeing Patrick in a play in Central Park? And then there is the question, which is what the play is all about, as to what exactly each character wants and eventually gets, for better or worse, from each other. While the first scene finds Patrick talking about the hardships of being an actor – perhaps Patrick’s own story – “Living in a moment, a truthful moment for the whole world to see is the hardest thing you could ever possibly do. Living any longer than you have to is quite the task,” at the same time he seems to buttering Jeremiah up for some future use. In a second lesson held on another day, with acting chops for both actor’s accruing thrice the power of the first go around, and that is saying plenty, Patrick and Jeremiah go at each other’s throat, mentally and physically. At one point, Jeremiah asks Patrick’s about his life. Under the forceful hand of Patrick who is still holding all the power, a now shirtless at Patrick’s command, Jeremiah starts out by saying, “I had a normal upbringing.” Not buying this story, Patrick goads Jeremiah into delving deeper into the truth of his life. Though painful, as well as cathartic for Jeremiah – he is made to cry – one gets the feeling, after he tells his story that he finally came of age. This moment was also painful for the audience. I had tears in my eyes, and the lady behind me cried out, “Oh No.” As for Patrick Jeremiah’s vulnerability, who is now fully in the hands of his teacher, literally, and figuratively, adds more than a tinge of eroticism to their relationship. The epilogue jumps ahead some five years. We are now watching Welcome To Hollywood Tonight!, a TV show, in which Jeremiah, now a bifilm star with a newly acquired air of confidence, is being interviewed by TV host Mark Bradley, played by Realbuto, about his role in the hit movie, ironically called In Control. No longer slovenly dressed, Realbuto, now in suit and tie, sporting a different haircut, and wearing heavy black-rimmed glasses is barely recognizable. Sitting side by side on two chairs, Bradley, in a newly acquired upbeat voice, peppers Jeremiah with the usual mundane questions. Everything goes along well until Jeremiah is asked what effect had his old acting teacher Patrick Ness had on his career. Did he make you a better actor, a better person Bradley asks? Resurrecting Ness , a subject Jeremiah is uncomfortable with, he is totally unnerved. It is the beginning of the end of the play. I don’t dare tell you what transpires, but rest assured, it is uncanny, surreal, frightening, and a stroke of genius on the part of the playwright, director and both actors. YES falls into a category, a genre, if you will, in which two characters, metaphorically speaking, battle to the death. David Mamet’s play Oleanna, a power struggle between a university professor and one of his female students who accuses him of sexual exploitation comes to mind, as does David Ives, Venus in Furs which pits an actress against a playwright director. A similar combativeness is found in Sam Shepard’s Fool For Love in which May and Eddie, former lovers who meet again in a motel in the desert.